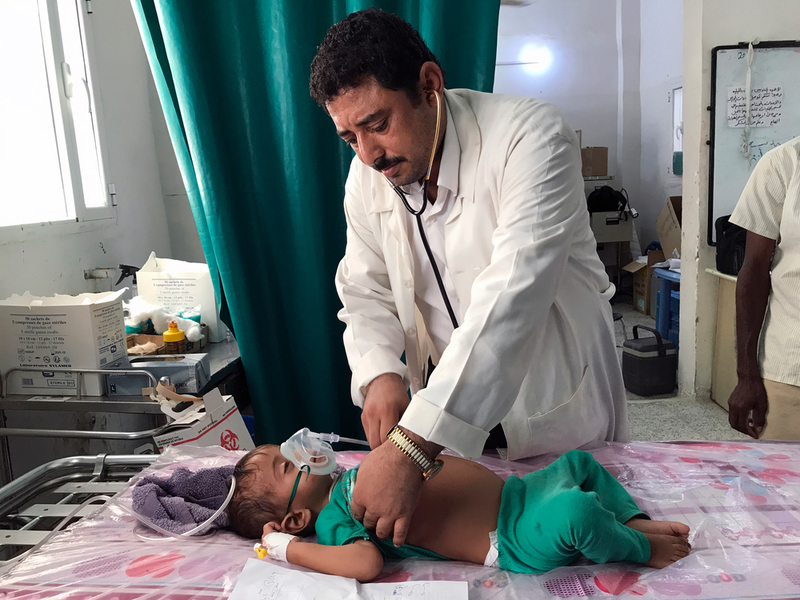 Gisela Vallès is a medical team leader at the Médecins Sans Frontières/Doctors Without Borders (MSF) hospital in Abs, the capital of the district of the same name in northern Yemen. Increased fighting in the region in recent weeks is causing new waves of displacement. Gisela explains the challenges and obstacles her team faces in providing assistance to the displaced groups and host communities. The majority do not have access to health services because, after several years of conflict, there are few health centres open in Abs district. Many health centres are no longer functional or are open for only a few hours a day with just a nurse or very few staff. Those working in the health centres have not received salaries for more than two years and work without adequate medical supplies. The health system can’t respond to the needs of the IDPs and, at the same time, we are severely restricted in the assistance we can offer in the places that are absorbing new displaced communities. In September, our mobile team was only able to go out to the periphery of Abs seven times during the month, despite being prepared to leave every day. In addition to this, in recent weeks the Yemeni currency, the Riyal, has lost a lot of value, while inflation has risen, causing fuel and transportation costs to increase. This had made it unaffordable for many people to reach the hospital in Abs. It is important that the few medical organisations that are supporting the Ministry of Health on the ground gain more access to address the needs of vulnerable displaced communities. MSF doctor treating a little patient in a hospital in Abs. One consequence that strikes me is seeing many patients arrive too late to the hospital. Some pregnant women and sick children arrive so late that we can’t save their lives. Virtually none of the women here receive antenatal care because this service is non-existent or ineffective outside of Abs town. They arrive with conditions that could be prevented, such as eclampsia and pre-eclampsia, which can both be fatal to the mother. By providing proper antenatal care and ensuring a safe birth we could reduce the risk of complications for both mothers and newborns. How do you find patients? In areas where the security situation and the authorities allow, we have a network of community health workers that manage a referral system for the most severe cases. Currently we focus on area with new IDP settlements where the most basic services are missing. In September, 153 patients from other parts of the region were referred to the Abs hospital, 50 percent more than in August, while in July the situation was more stable. The forecast is that in the near future there will be many more patients referred, as the hostilities intensify. 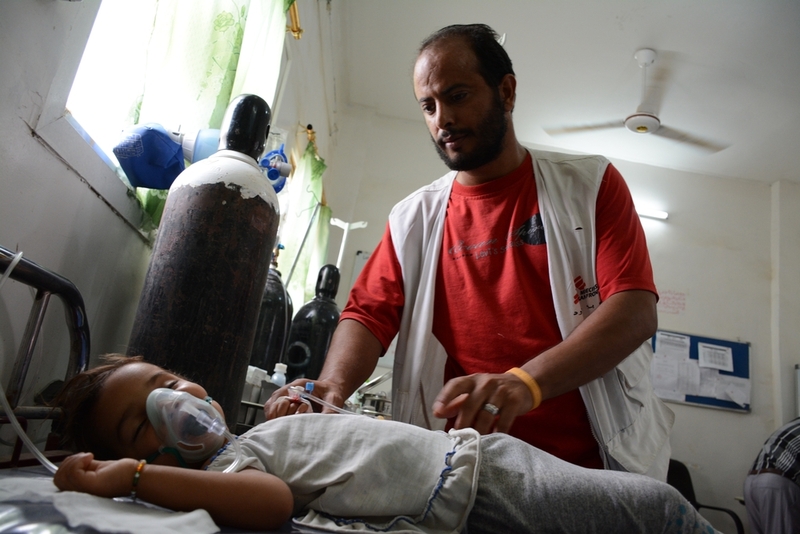 MSF nurse and emergency room supervisor checking on a child patient with a severe dehydration in Abs hospital. The worsening fighting (which escalated in March 2015) is undermining the capacity of NGOs on the ground to provide relief, water and sanitation services, food and more. The high inflation, linked to the rapid devaluation of the Ryial, the import restrictions etc. can have an impact on the nutritional status of the population. We continue to receive many cases of easily preventable diseases, such as diphtheria. This shows that the impact of the war on the deteriorating health system is increasingly affecting vaccination coverage.